Through this one-day meeting, BAPPENAS and the Center on Child Protection at the University of Indonesia drew together stakeholders as a first step in building a long-term partnership and explored current achievements and gaps in social protection programming. 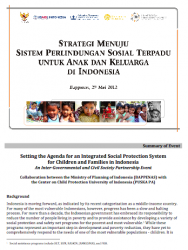 They conceptualized steps to take towards developing an integrated social protection system. This is the summary report of the meeting held in May 2012.